This morning during my personal growth time I was on twitter studying the #leadership tweets. I came across a tweet of the Italian Proverb: “After the game, the king and the pawn go into the same box.” Thanks @robertshemin for tweeting the proverb. I promptly retweeted and began thinking about how powerful the imagery of this was for a guy like me who firmly believes in a flattened hierarchy, leading from where you are, and the fact that it is not about me. I must admit I know how to play chess, but I am not an avid player. Nor do I have any desire to become an avid player. In fact I really kind of find it a boring game, but that is beside the fact! I do know enough to know in a chess game, the king is the most valuable piece, pawn the least. That being said, i have played enough chess to know that if you do not have the pawns moving into the proper positions you cannot win. 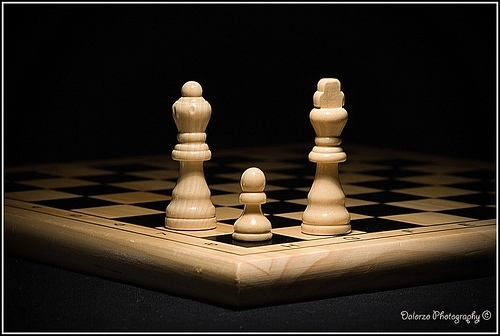 But once the game is over, both the king and pawns return to same box from which they were taken out. Another lesson I draw from this proverb is that, in the end, all our achievements and rank should not be overvalued, since in the end, we all – go back in the same box. Even though we all hold different ranks, titles, and roles; in the end we are all the same. Therefore, I should never take advantage of my rank in terms of hierarchy at the expense of another, nor should I allow myself to be taken advantage of or undervalued by someone of higher stature. Because, as you have heard me say in many blog posts, I believe everyone has the responsibility to lead from where they are – regardless of hierarchy. So as you start this last work week before Christmas, remember that every piece in your organization’s chess game is crucial to it’s success and at the end of the game they all go back in the same box!